At the start of any homicide inquiry, one of the first things the inquiry panel has to do is to get the killer’s permission to see the medical records. Under the current system of Patient Confidentiality medical records cannot usually be examined by anyone not directly involved in delivering care. For any independent homicide inquiry to proceed, the patient has to give consent for their records to be disclosed. This means the inquiry has to ask the killer for consent before they can investigate the death. The patient can refuse permission. In such cases the inquiry team has to go to court to get permission from a judge to see the files. Judge’s rarely refuse such permission, (as it’s matter of public interest), so the whole exercise is pretty pointless and just leads to further unnecessary delay. 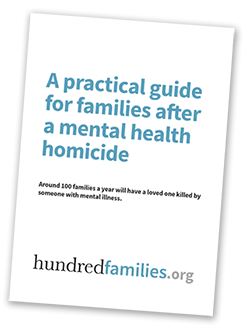 In some cases Mental Health trusts refuse information to the families of victims on the grounds of ‘patient confidentiality’. Sometimes it emerges that the withheld information actually has little to do with personal medical history but rather more to do with systemic problems and failures in the system. The fact that a patient’s records are in a complete mess won’t disclose any personal information about the patient, but it is hugely embarrassing for the professionals charged with keeping good and accurate files, particularly in an area where a patients previous history is so vital to their future treatment. There is no independent review of information deemed to come under ‘patient confidentiality’. Such material is also not subject to the Freedom of Information Act. In some cases members of the patient’s own family, friends or other agencies worried about a persons deteriorating mental state, have not been told important information out of misplaced concerns for patient confidentiality. See also Case of John Bryceland who murdered his partner Jacqueline Hughes, in Glasgow in August 2007. (She pleaded to section him, MH services said they couldn’t discuss it with her, he killed her days later). I work in prison health in the north east of england and we are now becoming involved in domestic/mh homicide in relation to those people who have recently been released from prison and in particular looking closely at their aftercare and ensuring that relevant medical records are passed onto community services. Could you let me know of recent cases involving ex prisoners. It was my mum that died and I’m looking for as much info as I can about HER THANKS!!! !